Does Pakistan have any precise idea ? Do the Pakistani security agencies have any precise idea of the presence of US spies and CIA contractors operating inside Pakistan? Well, the Washington Post has revealed that after 9/11 the growth of these agents has gone beyond all bounds and even Robert Gates did not know their exact number! A total of 854,000 people were given top-secret clearance and these include 265,000 contractors like Raymond Davis. “Contractors kill enemy fighters. They spy on foreign governments and eavesdrop on terrorist networks. They help craft war plans … they are among the most trusted advisers to the four-star generals leading the nation’s war,” reveals the leading US newspaper in its “Top Secret America” report. Although the report does not reveal the total number of CIA agents and contractors inside Pakistan it does endorse the media reports of the unprecedented growth of CIA network in Pakistan in the post-9/11 era when the Americans were given free hand to do whatever suited them, even if it was against the interest of Pakistan. The report uncovered what amounts to an alternative geography of the United States, a Top Secret America created since 9/11 that is hidden from public view, lacking in thorough oversight and so unwieldy that its effectiveness is impossible to determine. “It is also a system in which contractors are playing an ever more important role,” it said and added: “The Post estimates that out of 854,000 people with top-secret clearances, 265,000 are contractors. So great is the US government’s appetite for private contractors with top-secret clearances that there are now more than 300 companies, often nicknamed “body shops,” that specialise in finding candidates, often for a fee that approaches $50,000 a person, according to those in the business. Such is the shabby business of these contractors that the Post claims that even the US government doesn’t know how many are on the federal payroll. The Post quoted Robert Gates as saying that he wants to reduce the number of defence contractors by about 13 percent to pre-9/11 levels, but he’s having a hard time even getting a basic head count. “This is a terrible confession,” he said. “I can’t get a number on how many contractors work for the Office of the Secretary of Defence,” referring to the department’s civilian leadership. The Post’s estimate of 265,000 contractors doing top-secret work was vetted by several high-ranking intelligence officials who approved of The Post’s methodology. The newspaper’s Top Secret America database includes 1,931 companies that perform work at the top-secret level. More than a quarter of them – 533 – came into being after 2001, and others that already existed have expanded greatly. Most are thriving even as the rest of the United States struggles with bankruptcies, unemployment and foreclosures. The privatisation of national security work has been made possible by a nine-year “gusher” of money, as Gates recently described national security spending since the 9/11 attacks. The report admits that the CIA contractors’ misdeeds in Iraq and Afghanistan have hurt U.S. credibility in those countries as well as in the Middle East. Abuse of prisoners at Abu Ghraib, some of it done by contractors, helped ignite a call for vengeance against the United States that continues today. Security guards working for Blackwater added fuel to the five-year violent chaos in Iraq and became the symbol of an America run amok. The report, however, did not mention what Raymond Davis and his likes have done or are doing inside Pakistan. the use of false allegations (words or acts) with intent to harm others. What we in the Muslim world fail to understand are the dual standards followed on this issue by the West, ably led by Washington. It may take a voluminous book to enumerate cases in which the misnomer of free speech has been castigated and punished in the West. Post 9/11 laws have become an enabling guise to perpetrate extreme excesses at will. The dichotomy too is brazenly blatant if one denies the Holocaust. Tarek Mehanna, a twenty-nine year old American Muslim pharmacist, was sentenced to 17.5 years in prison. He was accused of “conspiring to support Al Qaeda” by “taking to the Internet to try to spread the terror group’s message.” All charges, as are evident from his messages now in public domain, were false. Javed Iqbal, a Pakistani-American and a 25 year resident of New York, was sentenced to 69 months in prison. His sin was to offer to broadcast Hezbollah’s Al Manar television channel for viewership in the US. The Dutch far-right politician, Geert Wilders, was compared to a Nazi guard in a cartoon posted by Joop.nl. It had to be removed after threats to the website. However, Wilder’s fitna and his rant of the Holy Quran being “the Muslim Mein Kampf” was defended as his given right to express himself. One can quote many more examples of the myth of freedom of speech in the West. The mere denial of the Holocaust is a crime in many Western countries. German author and historian, Ernst Zundel, has spent seven years of his life behind bars as a result of expressing his viewpoints and opinions about the Holocaust. French President François Hollande stripped John Galliano, a fashion designer, of the Légion d’honneur (France’s highest public distinction). This followed his conviction on charges of ‘public insults based on origin, religious affiliation, race or ethnicity.’ He had made anti-Semitic remarks. Actor and director Mel Gibson was branded an anti-Semite when he made the film The Passion of the Christ. Islamophobic rhetoric, caricatures and movies pave the way for a backlash that has led to world-wide protests and the killing of Americans in Benghazi and Muslims in their home countries. In a decade Muslims will account for nearly 9 percent of Europe’s mainland population. This has led to an increasingly potent group exploiting the West’s post 9/11 fears, and institutionalising Islamophobia. In the US alone, American Muslims, accounting for less than one percent of the population, have been the target of 15 percent of religious hate crimes since the last year. More than a decade after 9/11, polls show that nearly 50 percent Americans believe that Islamic values are incompatible with American ones. Washington should spare us the freedom spiel. History is a testament to the ‘freedom’ that was wrought upon the indigenous natives of the US and the Western hemisphere. Millions in Iraq and Afghanistan are the latest victims of this ‘freedom’, while Pakistan and Iran are in the cross-hairs. Never have morals and justice seen such a lopsided equation; never did freedom invoke such nightmarish reality. However, our response to the despicable film has led to the death of 23 of our own, with more than 200 wounded and property worth billions gutted. In doing so, we only strengthen the demented Nakoulas and Terry Jones of the Islamophobic brigand. We need to channelise our strength and resources to force Western governments to rectify their biased and lopsided stance on this issue. With the looming US elections, the Muslim lobby there should create a united stand that makes it clear that their vote is tied to this imperative condition. Muslims in European countries should do the same. The OIC has to take a more pro-active role and get out of its slumber mode. Our diplomatic missions in the West should take an unambiguous and forceful stand. By announcing a holiday and performing their usual disappearance act, the government shares responsibility for the death and destruction. Musharraf played the ‘Taliban near Islamabad’ card to prove his relevance to Washington. Lal Masjid became the beginning of his end. The mysterious presence of masked men bearing the Al-Qaeda flag was something that even Musharraf’s relevance game missed. Playing unholy politics, as seen last Friday (September 21, 2012), in the name of the Holy Prophet (pbuh) is in itself a sacrilege. It may yet be the undoing of this dispensation too. I am a common man and have concerns about common people, may they be living in my country, under Super Power (USA), in Europe or cold world of Russia & China or in the Middle East or far-East. Common man is living in this world to work hard and pay for the comfort of the influential. Governments these days are spending more of the common man’s (tax-payer’s) money to ward off fear of danger to their self than on welfare of common man from whom the money was extracted. Common man elects them to elevated positions and thereby cause to kill common man on the globe. Common man fails to understand that the ongoing killing of it’s lot is ‘War on Terror’ or ‘War of Terror’ as people are killed somewhere by suicide bomb and elsewhere by government forces’ fired missiles while they are busy in marriage ceremony, religious congregation, shopping in the market, traveling to visit friends or witnessing a movie or drama. Victims in all the cases are innocent people who are killed without having caused any provocation. The most confusing thing is that so far no one has sincerely tried to define what is terrorism and who, in fact, is a terrorist because two different persons doing the same act of killing, one is named terrorist and the other is said to have been under understandable emotions. 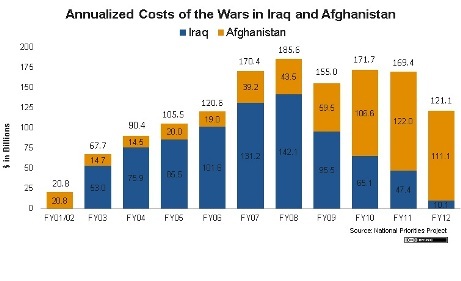 Since the U.S. invasion of Iraq in March 2003, National Priorities Project has tracked the costs of the wars in Iraq and Afghanistan. Recent events, including the end of U.S. combat operations in Iraq in December 2011 and the winding down of the troop “surge” in Afghanistan, have led to the question – what’s going to happen to funding for U.S. operations in these countries? Annual funding will be lower than in the past. 1. The wars will continue to draw on taxpayer resources even after combat operations in both countries have ended. 2. The funding stream will increasingly flow through federal agencies other than the Department of Defense, primarily the State Department and the U.S. Agency for International Development. 3. NPP will continue to analyze funding for Iraq and Afghanistan – and the counters will keep rolling – for as long as U.S. taxpayers are asked to support the direct and indirect costs of these wars. Total War Funding: $1.38 trillion has been allocated to date to fund the wars in Iraq and Afghanistan, including $121.1 billion in fiscal year 2012.
a) Iraq: To date, $807.4 billion has been allocated for the war in Iraq since 2003, including $10.1 billion in fiscal year 2012.
b) Afghanistan: To date, $570.9 billion has been allocated for the war in Afghanistan since 2001, including $111.1 billion in fiscal year 2012. Libyans tried to rescue Ambassador Chris Stevens, cheering “God is great” and rushing him to a hospital after they discovered him still clinging to life inside the US Consulate, according to witnesses and a new video that emerged from last week’s attack in the city of Benghazi. The group of Libyans had stumbled across Stevens’ seemingly lifeless from inside a dark room and didn’t know who he was, only that he was a foreigner, the man who shot the video and two other witnesses told The Associated Press. The account underlines the confusion that reigned during the assault by protesters and heavily armed gunmen that overwhelmed the consulate in Benghazi last week, killing four Americans, including Stevens, who died from smoke inhalation soon after he was found. US officials are still trying to piece together how the top American diplomat in Libya got separated from others as staffers were evacuated, suffocating in what is believed to be a consulate safe-room. Soon after the attack, Libyan civilians roamed freely around the trashed consulate, its walls blacked and furniture burned. Among them were the videographer al-Bakoush, and a photographer and art student he often works with. They heard a panicked shout, “I stepped over a dead man,” and rushed to see what was going on, al-Bakoush said. The body had been found inside a dark room with a locked door accessible only by a window. A group of men pulled him out and realized he was a foreigner and still alive. The next scene shows Stevens lying on a tile floor, with one man touching his neck to check his pulse. Al-Bakoush said that after that scene, they put Stevens in a private car to rush to the hospital. The video has been authenticated since Stevens’ face is clearly visible and he is wearing the same white t-shirt seen in authenticated photos of him being carried away on another man’s shoulders, presumably moments later. The photographer and student who were with al-Bakoush at the scene gave the same account as he did. “We were happy to see him alive. The youths tried to rescue him. But there was no security, no ambulances, nothing to help,” said Ahmed Shams, the 22-year-old arts student. The accounts of all three witnesses mesh with that of the doctor who treated Stevens that night. Dr. Ziad Abu Zeid told The Associated Press last week that Stevens was nearly lifeless when he was brought by Libyans, with no other Americans around, to the Benghazi hospital where he worked. He said Stevens had severe asphyxia from the smoke and that he tried for 90 minutes to resuscitate him with no success. Only later did security officials confirm it was Stevens. Fadl said he drove to the hospital behind the car carrying Stevens. Never take some one for granted.